When a literary agent sends a novel manuscript out to acquiring editors at major publishing houses, s/he likes to send it with everything the editor might need to put the work in context. 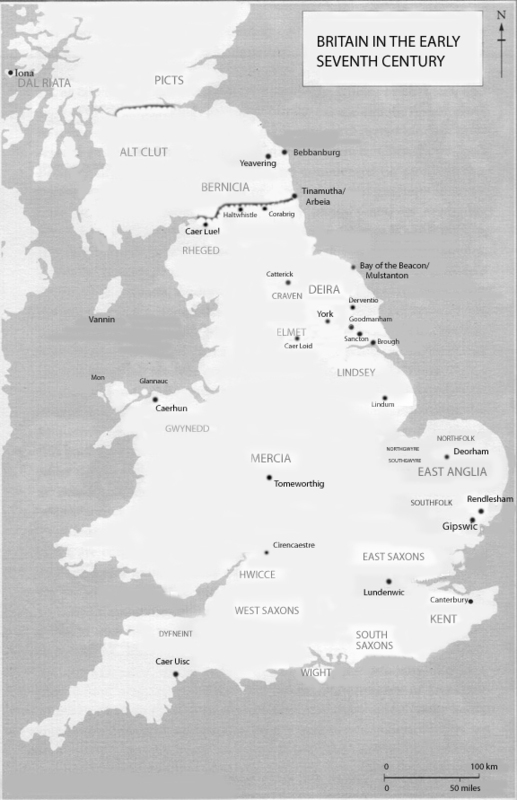 For Hild, my novel about Hild of Whitby (which of course wasn’t called Whitby then), set in early seventh century Britain (the narrative spans 617 – 631 CE), this includes a map, a glossary, and a family tree for the main character/s. I’ve spent the last two weeks happily constructing this supplemental material. You’ve already seen Hild’s family tree, along with all my questions and caveats. Today it’s the turn of the maps. I’ve included three: my first draft attempt, the second iteration made with help from a scientist friend who downloaded GIS data, and the final (so far) representation which collates data from several stages and was polished by a friend who has mad Photoshop skills. If you only have time to look at one, look at the last one. You can see a much bigger version of each map if you click on it. I think of of this as my sketch map. I made it by brazenly scanning a map from the endpapers of someone else’s book (I will certainly buy the author a drink given the opportunity) and then scrubbing out the names and replacing them with my own (by the squint-and-point method–no claim to accuracy at this stage). This is where you see how sadly lacking I am in Photoshop skills. (Though my Anglo-Saxon Twitter icon might have been an early giveaway.) I hadn’t the faintest idea how to make something that looked like a wall, so I just drew a thick line, then ‘bit’ chunks out of it with dabs of the Brush tool. I used the same tool to dab in the dots for vills and other settlements. And to create Puffin Island/Glannauc, just off the eastern tip of Anglesey/Mon. Glannauc makes an appearance in the book. More on that later. But this first map was never intended to be anything but an initial sketch map, a for-personal-use-only building block for the real thing. But I found this map difficult to read. And it still needed territories/peoples adding, and walls, and so on. And I needed more room. So I cropped it to the size I needed, and begged for help from a photographer friend. If you click on the map, and then zoom in, you’ll see that there are actually two Glannaucs: the tiny one is the real one. The big one right next to it is purely imaginary. I just needed the reader/editor to be able to see it. That’ll get fixed for publication. So will the relative sizes/fonts of the various peoples and their regions. For this iteration my priority is for editors to be able to find a region on a map quickly, so they didn’t have to go look things up and get bumped out of the story. You’ll also see that there’s a lot left out. I was ruthless: if it wasn’t in the story, it’s not on the map. As it is, there are some Irish places, and some non-British locations (Hedeby, Frankia, Less Britain) that are mentioned in the story but not included here for the sake of clarity and simplicity. If you see something you don’t agree with, please let me know–either by email or in a comment. I want to get this right. 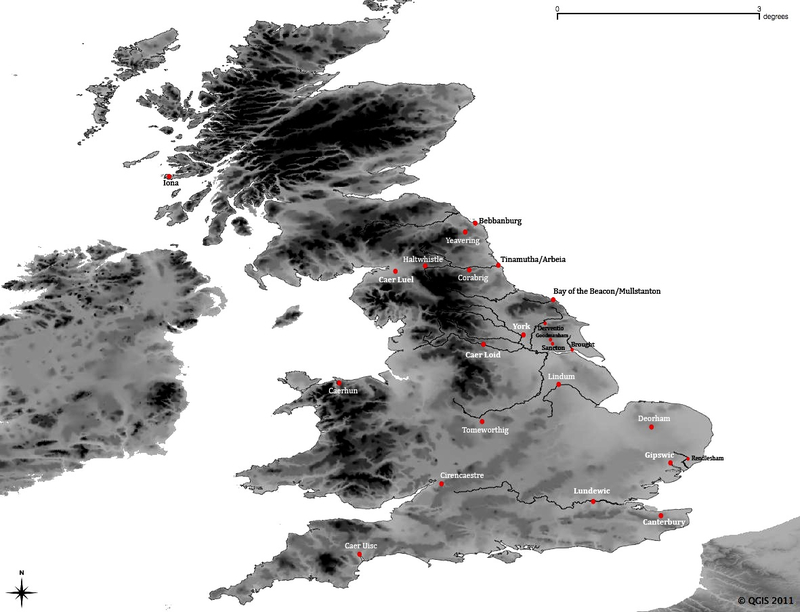 I’m hoping I can do the final map for the book in colour. I’m hoping I can do an absolutely enormously detailed map for the website I’ll build to support the book closer to publication. I’d love to illustrate tiny little scenes from the book on this enormous map, and include tokens/banners/signs of dynasties/peoples on their region (ravens, boars, bulls, eagles). What else have you often wished authors included on their maps? Tell me what you’d love to see. Please. Many thanks to Angélique and Jennifer for their labour of love. Good friends, both. The final version is beautiful and would make great end papers in B&W, in my opinion. I agree with David. The final map looks great. Plenty of detail without seeming cluttered. I think the 3D landscape works really well, too. Most maps in novels tend to be 'flat' but this will give the reader an idea of the kind of terrain Hild and her contemporaries had to deal with on their travels. Thanks, David. That's one of my hopes, that the map that ends up in the book gives as much info as possible about Hild's world–without being so busy that it becomes confusing. I'd love for the map to be one of those big ones that folds out. Nicely done! As a civil designer who has made many a topo and worked in archaeological illustration as well, I have to say, impressive! It is a bloody gorgeous map, that last one, relief and rivers making everything make sense. In the words of Zaphod Beeblebrox, it's so amazingly amazing I think I'm going to have to steal it, or at least Photoshop new labels onto it and use it in lectures. OK, maybe not now I've admitted as much. But I would. 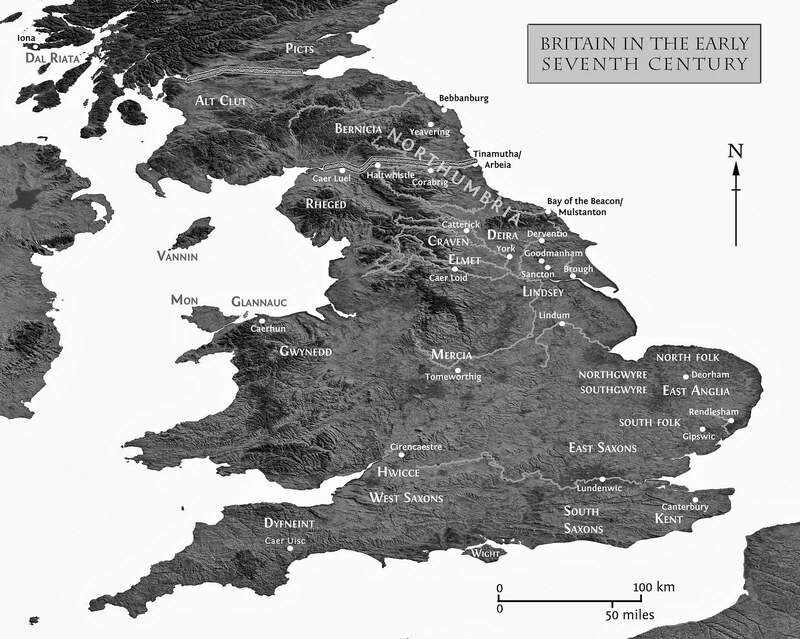 The only thing I can think of that might still be worth adding is some of the bigger Roman roads. I'm just thinking of Bede's bit about there being drinking fountains along the roads, mainly; it's always seemed to me that while that's probably just fluff it does imply a working road system in a least a few places. Tim, that second comment addressed to 'David' was actually for you, sorry! I want the map to be an aid to imagination, absolutely. Barba, well, the credit really goes to my friends, the ones who did the painstaking work. I'll pass the compliment along. Thank you. Jonathan, roads, absolutely. Yes. And I want to find a way to make the rivers look a bit better. I think different roads had different levels of repair/upkeep/use. (I mention some of that briefly in the book, when Hild is near Lindum. Let me know if you'd like to read it.) I'd love to find a way to represent that–maybe on the humongous wall-sized version, if I ever get it done 🙂 I also love the idea of doing little pictures of fountains here and there. As for repurposing the map, if it's just for classroom use, absolutely, feel free. I'd be happy to think students might get a better idea of the terrain. When I add in roads (or maybe when you do?) we should figure out a way to share that, too. Jonathan, if I have to, I can just guesstimate the roads using maps from old books–though it would be lovely to figure out a way to get them perfectly accurate, like the topography. I'm just not sure how to do that. But if I do, I'll make sure you get a copy. I want to fix the walls, too. As for not having time to read, oh, I hear you on that! No worries. I'll be very happy to send you a copy of the finished article–or a digital version, if you prefer to use a Kindle app or something similar–next year (or whenever publication rolls around).